Welcome to Intro To Hand Tools! Big news! 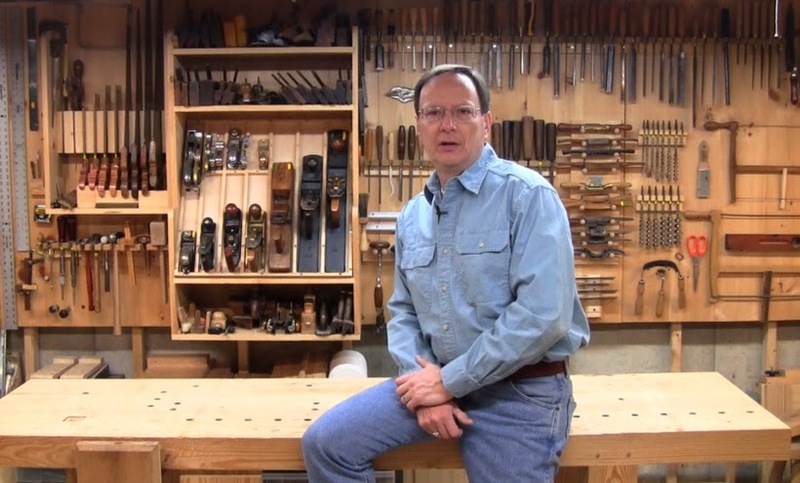 I'm very excited to announce my new course at Popular Woodworking University, the new site for online classes from Popular Woodworking Magazine. The course is Intro To Hand Tools. Click here for registration details and a 3-minute introductory video. Update: the Fall 2015 session is now open, running through January 21. You can read some reviews of the now-completed first session here. This ambitious project is my magnum opus. In a series of nearly 60 videos, ranging from 2 to 20 minutes, I teach you everything you need to know about the basics of doing all your woodworking with hand tools, starting from bare lumber. You can watch in bite-size chunks. This is Hand Tools 101. Much of the concept was motivated by all the online forum posts I saw that start "I'm new to hand tools, and I need help with...". I've gone through all the same problems you have, so I can show you what worked for me. I cover multiple methods for doing things, so you can match the method to your preferences, tools, and project at hand. In my Fistfights and Fundamentals segments, I outline the arguments about the different methods, then break them down and look at why they work. 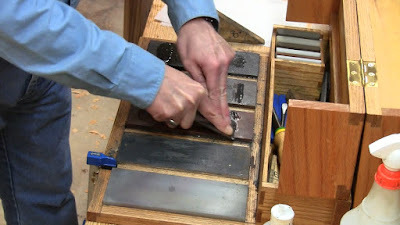 One of several different sharpening methods. The cost is $59. You'll get all the knowledge I've accumulated, much of which you can read about here, but demonstrated on camera with a variety of closeups and angles so you can see it in detail. These photos are stills from just a few of the videos to show what you can expect. You'll also see how to deal with the problems that crop up. 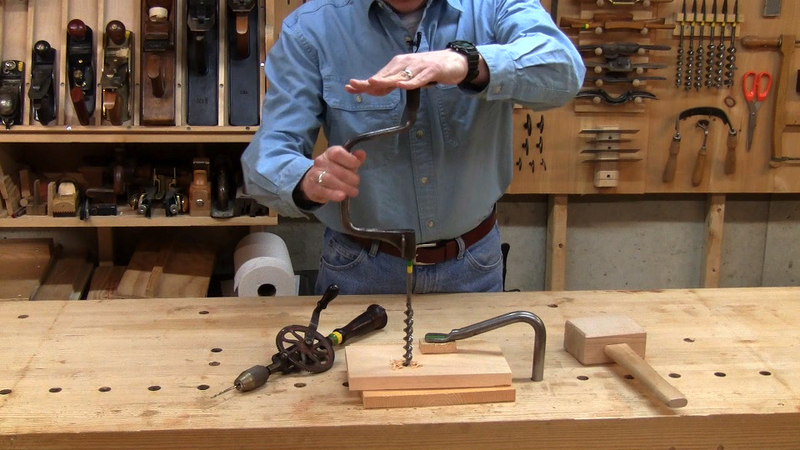 This is for anyone with any level of interest in hand tools, no prior knowledge required. 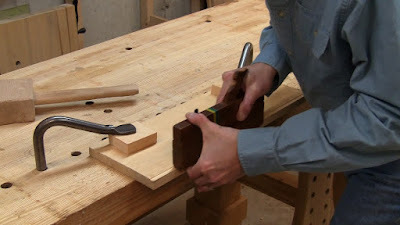 Or if you already have some hand tool experience, or use power tools but are interested in incorporating hand tools into your work, this will help you expand your capabilities. How to angle the saw when correcting a rough rip cut. 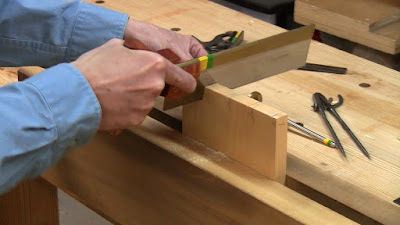 How to joint an edge as part of the FEWTEL sequence. 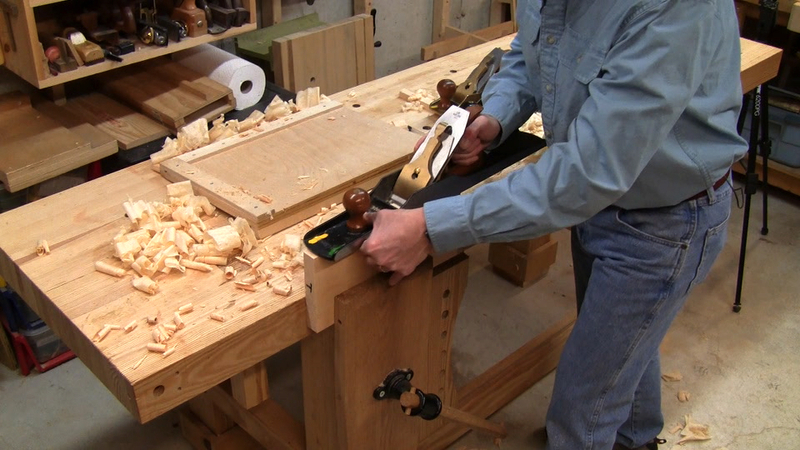 If you have limited space, such as an apartment or small house, hand tools are a great way to enjoy the craft. All you need is 4'x6', just 24 square feet. It doesn't even need to be permanent. 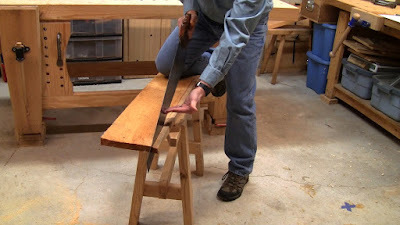 You can setup a folding workbench to do your work, then fold it up and set it aside. How to raise a panel using handplanes and a chisel, rabbet plane, shoulder plane, or skew block plane. How to rabbet an edge using a chisel, moving fillister plane, or wooden skew rabbet moulding plane. 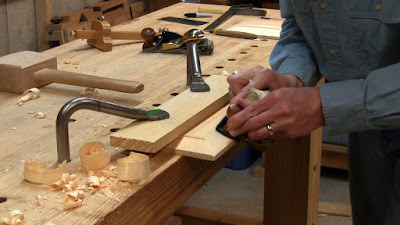 By the time you've completed the course and practiced the skills, you'll be able to take on any project with hand tools. You'll also be ready to take more advanced classes from any of the fine woodworking schools in the world, confident that you have the background to make your tools sing. How to make dovetails, pins first or tails first, sawing or chiseling the waste. My favorite antique tool, the Spofford brace. This was made about the time Abraham Lincoln was president. Got questions? Like, why do everything with hand tools when there are power tools? Watch the 3-minute video introduction on the course page. You'll get some preview of the lessons. 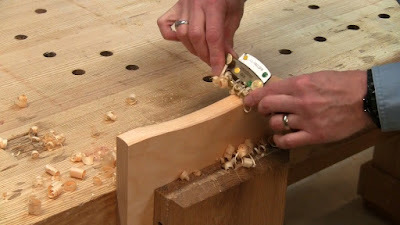 How to shape a curve using a spokeshave. The course is in 7 major parts, each broken down into multiple video segments. Additional non-video content includes recommended reading, links, and tool lists. The syllabus is listed below. I'm still in the process of creating the videos, so the exact list may change a bit. Gary C. Hicks, Sr., with the guitar he built himself. Photo used by permission of Available Light Photography/Kathy Hicks Murray. The music you hear in the video is by my guitar teacher, Gary C. Hicks, Sr. 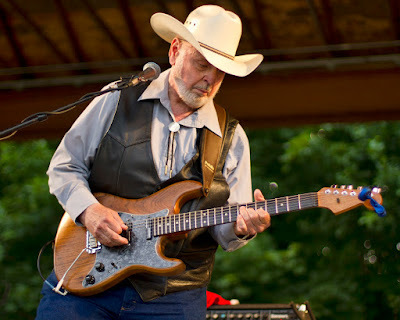 He'll be 75 this year and has been playing since he was in 7th grade. He plays decades of rock 'n' roll, country, jazz, and swing. His teacher was Bill Leavitt, who went on to head the guitar department at Boston's famed Berklee School of Music. Gary's been playing professionally since 1958 with local bands, opening on stage for national acts. His most memorable show was when he played with Fabian, one of the biggest stars of the day, complete with surging crowds of teenagers, filling in when Fabian's lead guitarist missed the plane. We recorded this in my workshop. After a little warmup on the electric guitar he built himself decades ago, he experimented with a few riffs and asked me what I thought. I said I liked it and asked what it was. Just something he made up on the spot, in the Chet Atkins style. He just improvised and filled bars until it was the same length as the video, making it look effortless. It sounds like 2 or 3 instruments, but that's one guy, one guitar, one take. Amazing! That's what 60 years of experience gets you. That's what it means to be a master of your craft. Congrats, Steve! That will be awesome. Congrats Steve. That sounds like an excellent deal and a great primer on handtool use.